This Saturday's program (2/19) has been postponed until next Saturday (2/26) at 2:00 PM. Join us then for "Mystery Algae of the Great Salt Plains" with Dr. Bill Henley of the OSU Botany Department! Just for a teaser, check out these photos I took at Dr. Henley's lab. Here are various bottles and vials containing algae cultures. Below is an experiment Dr. Henley is running. 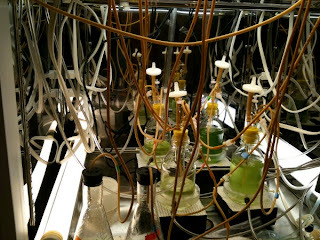 All the tubes are an automated system of delivering nutrients to the algae, then drawing off cells automatically as the grow, which keeps the culture in a state of balance, always with about the same amount of algae growing. In this set-up the cells from the first culture (on the left) go into a second culture (on the right) which is relatively nutrient starved. 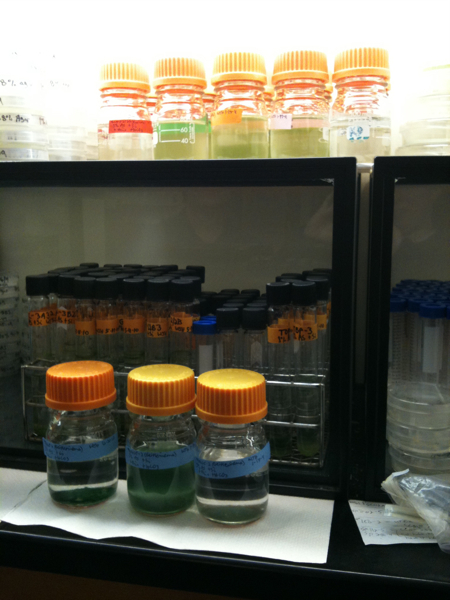 Dr. Henley is trying different configurations to figure out what might work well to grow algae commercially. Why would you want to do that? 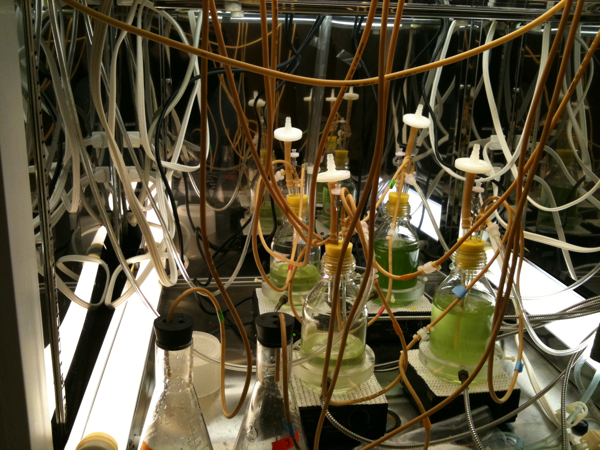 Algae can produce oils that may turn out to be a great alternative fuel source, if we can figure out how to harvest them efficiently. And here is a Google satellite image looking down on the Great Salt Plains, which is where the mysterious algae we'll be talking about was found. All that white - not snow! Salt!